Welcome to the Territory. Welcome to the Devil’s West. Shortlisted for the Endeavour Award! Winner of the Endeavour Award! Also shortlisted for a Washington State Book Award for Fiction! “Laura Anne Gilman has reimagined an American West that is alluring and gritty, strange and utterly convincing. Her prose is stunning, and her story and characters grabbed my heart and would not let go.” – David B. Coe/D.B. Jackson, author of the Thieftaker Chronicles. I just finished Silver on the Road (and am currently in that irritated I am finished the book mood) and I was just wondering if you have a plan for this series? Like is it going to be a duology or trilogy or do you envision a longer series. Just curious, I could see a longer series myself just because there would seem to be at least four corners of the Territory for them to investigate as well as dealing with the other borders and, I’d think, Gabriel’s own people and, something I suspect, Isobel’s likely actual parentage and then eventually the return to Flood and what they both choose to do going forward. Hi Kate, thanks for stopping by! There are currently two more books under contract, and I have hopes for at least one more, but that will depend on how well the first one sells/how happy my publisher is with me. 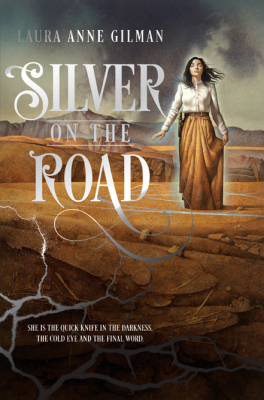 I absolutely loved Silver on the Road and posted an extensive review on my blog (http://fangfiction.blogspot.com/2015/10/new-series-laura-anne-gilman-devils-west.html). Here are some quotes from my review: “Gilman seamlessly slips the world-building into the narrative—not in big chunks, but in brief scenes that seem utterly natural….In an on-line interview, Gilman says that she is writing, “about the choices you make when you don’t have enough information, and the second chances you get to remake those choices. Dancing on quicksand, hoping they don’t drown.” That is a perfect description of Isobel’s journey in this book. The three main characters—Isobel, Gabriel, and Farron—are a delight, all fully developed, but all with secrets still left to uncover. Gilman has much to mine in future books, all of which I am looking forward to reading. This is a terrific start to a gritty, thought-provoking, imaginative new series.” I’m really looking forward to the next installment. esome lovely read. hopefully you will be writing about these people and their world frequently. first book of yours that I have read. definitally not the last. hopefully it wont be to long between books. thank you. Just finished this book. And I loved it. Left a 5-star review on Goodreads. Thrilled to read this is a possible four- to five-book series. What a refreshing new take on the paranormal/historical fantasy genre. The next book, THE COLD EYE, is scheduled for Autumn 2016. So not too long a wait! Downed this novel in a series of two days. Absolutely loved it!! Oh man, I’m super stoked for the next book. They way you wrote the Territory has me enraptured with it. This is not what I usually read, but I’ve been completely sucked in. Looking forward to whatever comes next for Isobel and Gabriel. I just finished reading Silver on the Road, and I wanted to tell you how much I enjoyed it–and to thank you for writing it! I look forward to reading more about the Devil’s Left Hand. I wonder what planted the seed for this in your mind? What image or story was the origin of this marvelous story of yours? In any case, thanks again for the story (and may you write many more). I wonder what planted the seed for this in your mind? What image or story was the origin of this marvelous story of yours? Oh, there’s a whole story for how this series began… I should probably write it up for posterity at some point, yeah? Just finishing “The Cold Eye” and am enjoying this series so much. The world building is fantastic, the setting is spooky and evocative, and I love the characters, especially Isobel and Gabriel. I hope you write dozens more. Thank you! I can promise at least one more, and several short stories, and possibly a novella. Not quite dozens, but…. I have a burning question–when does Isobel finally get pants? We know she needs them. *laughs* When she’s comfortable wearing them. Any plans on audio versions? Audible passed initially, but I’m hoping now that the arc is complete, we can get interest going, either from them or someone else. Listener requests help a great deal in that regard! Finished “Red Waters Rising” at 3:30 this a.m. and no, I am not a night shift worker. I’m so tired I can hardly type this, but I must know – how long until “Gideon’s Road”?!! And, I’ll be writing to Audible promptly. Thank you for years of wonderful books. Now please stop reading this and get back to writing!